Carpeting fitting for living area leading onto a staircase for a property in GarstangKSW Services are experienced carpet fitters, offering good quality carpet fitting at a reasonable price. If preferred, we can select your carpets for you as part of a wider design service, ideal for buy to let properties. Alternatively, if you're looking for something hard-wearing and stain proof, we also provide Laminate Flooring fitting services. If you require carpeting for your business, whether it be an office, cafe, nursery school, shop, showroom or other commercial premises, please contact us for a competitive price. We're fully insured with public liability and professional indemnity insurance cover. If required, we can provide our Carpet Fitting services as part of a full property refurbishment, whether it be for a rental property, preparing a house for sale or following a bereavement. 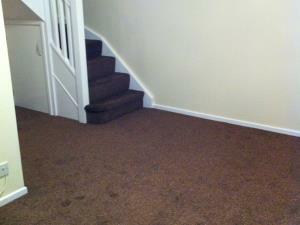 For examples of our Carpet Fitting work, please take a look at our Photo Gallery page. Based in Penwortham, we offer Carpet Fitting services throughout the Preston area including Penwortham, Leyland, Chorley, Blackburn, Garstang, Bamber Bridge, Fulwood, Walton-le-Dale, Lea, Ingol, Ashton-on-Ribble, Longridge and Lostock Hall.